AIDS Care is a Christian organization, which uses a holistic approach to address the needs of HIV-affected children and their families in Thailand helping them to break the vicious cycle of HIV/AIDS. AIDS Care finances schooling expenses, emergency needs and in special cases medicine. But its main work is focused on sharing Christ’s love and care, education, establishing fellowship and giving hope to those who often are in hopeless situations. Read more on What we do. The ministry has a solid local foundation and is held in place by the local workers, who have a call from God to help children and families victimized by HIV/AIDS. Local project leaders work together with a team from the missions organisation OMF International (formerly China Inland Mission or CIM) in the area. Some of the OMF missionaries have been working in Thailand for more than 25 years. AIDS Care empowers local people to carry the love of Christ to their communities. In Thailand, AIDS Care is registered under the legal umbrella of the Light for Thailand Foundation. This, combined with overall leadership from OMF missionaries, provides the ministry with a strong foundation. Our Vision is to break the vicious cycle of vulnerability experienced by the children in HIV/AIDS-affected families. Either one or both parents in these families are HIV-positive or have died because of HIV/AIDS. Our mission is to meet people who have HIV/AIDS with the love of Jesus, as a friend with no condemnation or demands. We will be God’s loving hands, reaching out with love, care, forgiveness and grace. Our focus is children (HIV positive and HIV negative) and their families who have been victimized by HIV/AIDS. 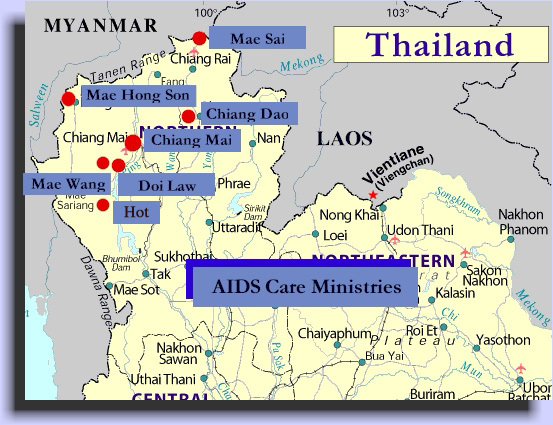 AIDS Care has 8 ministries in northern Thailand. Seven of them have a geographical focus and one, the Outreach ministry, functions across the 7 geographical ministries. AIDS Care Outreach ministry reaches out to several hundred teenagers in schools, camps and other settings in northern Thailand with important information about HIV/AIDS. The number of children supported by AIDS Care grew from 5 children in 2000 to 154 children in 2016. Approximately 90% of the children supported by AIDS Care are free of HIV, but 80% have lost one or both of their parents due to HIV/AIDS. They often live with their elderly grandparents. Due to their circumstances, they often are at risk of suffering the same destiny as their parents. Since it’s inception in 2000, AIDS Care has helped approximately 300 children affected by HIV/AIDS to receive an education.